would elicit such enthusiastic responses! when you sign up on a three-year rogers contract. it wasn't even a mail-in rebate, it was absolutely free! all of which took two hours. and left the store very happy. i hope this quells everyone's curiosity! ...and i'm sorry if you don't live in vancouver. I wish I were born and raised in vancouver and destined to have free iphone 3g. lol! well I'm super psyched for you two lovelies! :3 matching phones = sweetest thing!! i didn't think it was possible to want an iPhone even more than i do now... but after seeing this post, I DO! I need to join the bandwaggon of apple users! 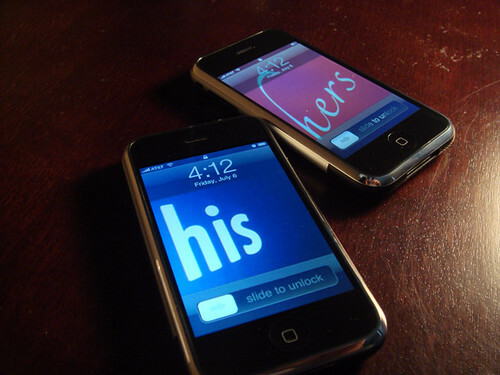 i LOVE the "his" and "hers" background! i'm sorry i don't live in vancouver, for that reason and many more! congrats on your new iphone. just stumbled across your blog and it's lovely. i'll be sure to stop back. wow, that is awesome!! i would LOVE to have an iphone! !